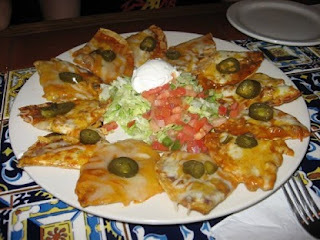 Today I have a secret recipe for one of my favorite appetizers served at Chili’s. The classic nachos are a simple dish, but it packs lots of flavor. Crisp tortilla chips are topped with seasoned chicken, cheese and jalapeno slices. This dish is great for when you’re entertaining guests or just enjoy them as an evening snack. Saute the chicken, onions, & peppers as directed on the seasoning pack.When done, drain mixture and set aside. Place the tortilla chips in a circle on a large plate that is oven proof or microwaveable. Layer the chicken, onions, & peppers on top of the tortilla chips. Layer the shredded cheeses on top of the chicken, and top with jalepeno peppers. Place the plate in oven at 350 degrees just until the cheeses are melted or microwave on medium. When the nachos are ready, add the shredded lettuce in the middle of the platter. Top the lettuce with the salsa & the sour cream and guacamole. Today I have a secret recipe for Chili’s chicken enchilada soup. This soup has a nice thick base and is loaded with chunks of chicken and spicy enchilada flavor. The best part is that this recipe can be prepared in under 30 minutes. Top this soup with crispy tortilla strips and sour cream. In a 3-qt saucepan heat the oil. Once hot, add the onions and spices and saute until onions are soft and translucent, about 5 minutes. In a separate bowl combine the Masa harina with 4 cups of chicken broth and whisk until combined. Pour mixture into the large pot, and stir constantly, cooking, for 2-3 minutes. Mixture will become thick. Pour in the remaining chicken broth, enchilada sauce and salsa, stir and bring to a boil. Add the cubed Velveeta cheese, and stir until melted. Stir in the shredded chicken. Serve topped with sour cream and tortilla strips. Today’s secret recipe will show you how to make one of Chili’s(tm) awesome appetizers. Their Big Mouth Bites are mini cheeseburgers that are loaded with flavor. Topped with bacon and sauteed onions then served with a jalapeno-ranch dressing. Make a big tray of these and you’ll be a hit at your next party. To make the jalapeno ranch dressing- in a blender combine ranch dressing, cilantro, jalapeno pepper, and tomato and blend until smooth. Cover and refrigerate for 2 hours before serving. Cook bacon in a large skillet over medium-high heat until browned and crispy. Drain on paper towels. Add the diced onion to the heated pan with the bacon grease and sauté until the onion is tender. Remove from the pan. Drain most about the bacon grease out of the pan, leaving about 1 tablespoon. Form the ground beef into small patties. Season on both sides with salt and pepper. Heat the skillet with the remaining bacon grease to medium-high heat. Add the hamburger patties and cook, turning once until the hamburgers are fully cooked (the internal temperature has reached 160 degrees). During the last few minutes of cooking top each patty with 2 of the cheese squares. Once the cheese has melted remove from the pan. While the burgers are cooking, cut the slider buns in half and spread butter onto the cut side of each bun. Place cut side down into a separate skillet over medium heat and cook until golden brown on the bottom. 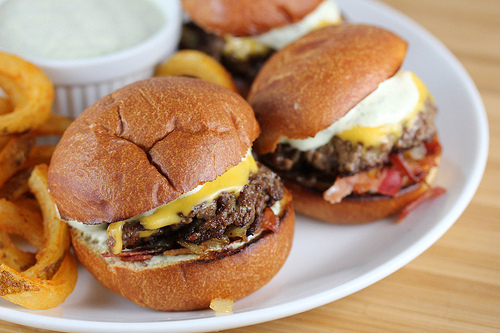 To assemble the sliders- spread a thin layer of the jalapeno-ranch dressing onto the top of the bottom half of each bun. Place a layer of crispy bacon and sautéed onion over the dressing. Place hamburger patty over the onion and bacon. Spread a thin layer of jalapeno-ranch dressing onto the bottom of the top half of each bun. Place the top half of the bun, cut-side down over the hamburger patties. 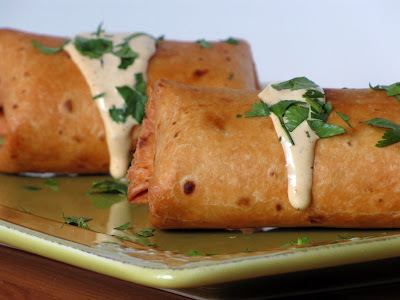 Today I have a secret recipe for one of my favorite appetizers at Chili’s, the southwestern eggrolls. Crispy flour tortillas stuffed with juicy chicken, black beans, corn, Jack cheese, chopped red peppers & spinach. These are always a hit at a party so you may want to triple this recipe. Heat a skillet over medium heat with one tablespoon of oil. When hot, add the scallions and minced garlic and cook 2 to 3 minutes or until the scallions are soft. Add the cumin, chili powder, and cayenne (if using) and stir to combine. Cook one minute longer then scrape the mixture into a food processor. To the scallion mixture in the food processor, add the drained and rinsed black beans, chicken breast, spinach, water, salt, and some pepper. Pulse a few times until the mixture is roughly chopped. Set aside. Wipe out the skillet you cooked the scallions in, add a little more oil, and set the pan over medium heat. Cook the corn and red bell pepper for a couple of minutes then dump in the bean mixture from the food processor. Stir to combine and taste for seasoning. The mixture should be thick but if it seems rather dry, add another tablespoon or two of water. I usually end up adding more cumin and chili powder (and sometimes a little more salt) because I like my filling to have a rather robust flavor. Take the pan off the heat and let the mixture cool for a few minutes. After the mixture has cooled, add the pepper jack cheese and stir to combine. Warm the tortillas per the package instructions. Spoon the filling into a 1/3 measuring cup and gently pack the filling. Dump the filling onto a warm tortilla and mold the filling slightly into an oblong shape. Fold in the sides and roll it up as if you were rolling a burrito. Insert a toothpick to keep the eggroll closed. Repeat until you have used up all of the filling. Begin heating about 3″ of oil (peanut oil works great) in a deep sauce pan. Begin preheating the oven to 200F. Insert a wire rack into a sheet pan and set aside. Once the oil reaches 350F, add 2 or 3 eggrolls (depending on the size of your pan) and fry for about 5 minutes – turning often. The eggrolls are done when the outside is brown and crispy. Transfer the eggrolls to the rack in the sheet pan and place in the oven to keep warm while you are frying the rest of the eggrolls. When finished, serve with your favorite dipping sauce.